The nuclide statistics in the Karlsruhe Nuclide Chart Online (KNCO) in Nucleonica are now available for the various editions as shown in the image below. Nuclide statistics for various editions. The values shown for the current 9th edition are from June 2014. An overview of the nuclide statistics for experimentally observed nuclides for the current and previous editions (8th edition, 2012; 7th edition 2006) is shown in the figure. It is of interest to note how the total number of nuclides (ground and metastable states) has increased since the 7th Edition 2006 from 3654 to the current value (June 2014) of 3959. The column “new” shows the total number of new nuclides in each edition. The column “mod” gives to total number of modified nuclides (includes new nuclides) in each edition. The column “KNC” gives the total number of ground states and metastable states in each edition. Also shown in the “KNC” column is the total number of elements and the total number of fission products included in each edition. 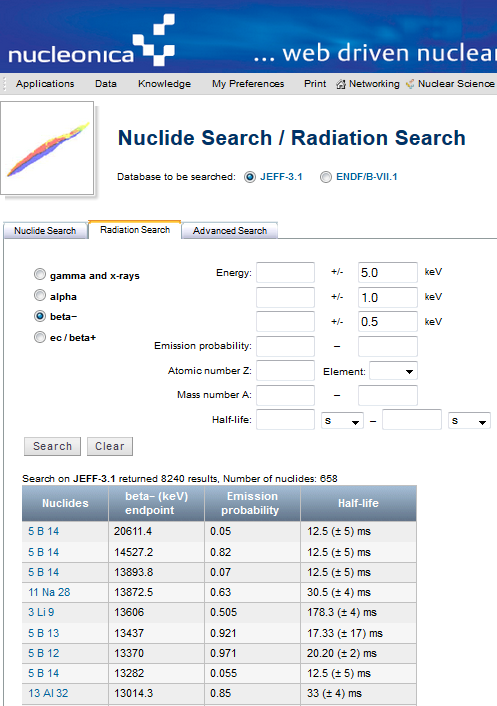 In earlier versions of the Nuclide Search / Radiation Search application in Nucleonica, the database searches were restricted to gamma and X-rays, and alpha particles. With this new release, the database searches have been extended to include ß- and ec/ß+ (endpoint energies). The energies and emission probabilites of ß- and ß+ particles arising from radioactive decays are of particular interest in fields such as nuclear medicine. In addition, the user has a choice of databases to be search: the European Datafile JEFF-3.1 or the US ENDF/B-VII.1. In the results shown above, a list of all ß- endpoint energies and emission probabilites in the database (JEFF3.1) are listed. In total there are 8240 ß- endpoint energies from 658 nuclides listed. The search can be further refined by specifying the energies in a given range, the element and mass number, range of half-lives etc. For ec/beta+ there are in total 7059 entries from 555 nuclides. In the database (JEFF3.1) no distinction is made between ec and beta+. For energies below 1022 kev (threshold for positron ß+ production) only electron capture is possible, and the energies and emission probabilites listed correspond to those for electron capture. For energies above 1022 keV both ec and ß+ emission are possible. The energy of the ß+ particles can be obtained by subtracting 1022 keV from the listed energies.